We went to 2 concerts and both were great. Especially I loved the second group. The second concert, Hidegard Lernt Fliegen! Extremely talented 6 musicians in one group! It was awesome. We bought their CD to listen more later. If they come to your town, don't miss them! Ok! So my point is that there are so many things going on and I found out that French people love Jazz! Jazz concerts everywhere! Being a Korean person, I am very proud of Yun Sun Nah, a Korean jazz singer who is very talented and currently very popular in France. I saw a poster during the Music festival in Montpellier ( It was huge! Again! ) and decided to go see her in Junas. Ok! another thing that you need to know, in south France, things are happening very very late. The main concert of the day, which was Yun Sun Nah's concert started 10:30 pm! Yup! So since we had a car for a day, I planned to go to all the towns around Montpellier where we've planned to go but never been yet such as Nîmes and the second time we went to Uzès and Sommière ( we've been there but we had a car problem last time so we didn't have a chance to explore the area thoroughly) We've already been to the famous Pont du Gard with our Meetup hiking group and it was fantastic! but we've never been to actual Nîmes. We passed many times, of course, when we took a train to somewhere east from Montpellier :) When I took a San Francisco history class in CCSF, the prof. said that when Levis used all up the sails from all the abandoned ships in SF bay, he had to import the fabric for his jeans which from Nîmes and that's why nowadays the fabric for the jeans called denim! ( from Nîmes - in French, de Nîmes.. got it?) Anyway, we drove to Nîmes to see the Roman amphitheater.. It's impressive structure but well… it's a old building that looks cool but… whatelse would you do with it except just looked at it and took some photos… I have to say, Nîmes… not too exciting place :) But enjoy the photos! Roman amphitheater, the best preserved Roman arena in France! I don't know what kind of building this is but it looked cool..
We spent enough time in Nîmes and drove to Uzès. Uzès Saturday market is very very famous among local people but I didn't have any chance to go there so if you ever in this area, try to go Uzès on Saturday morning! 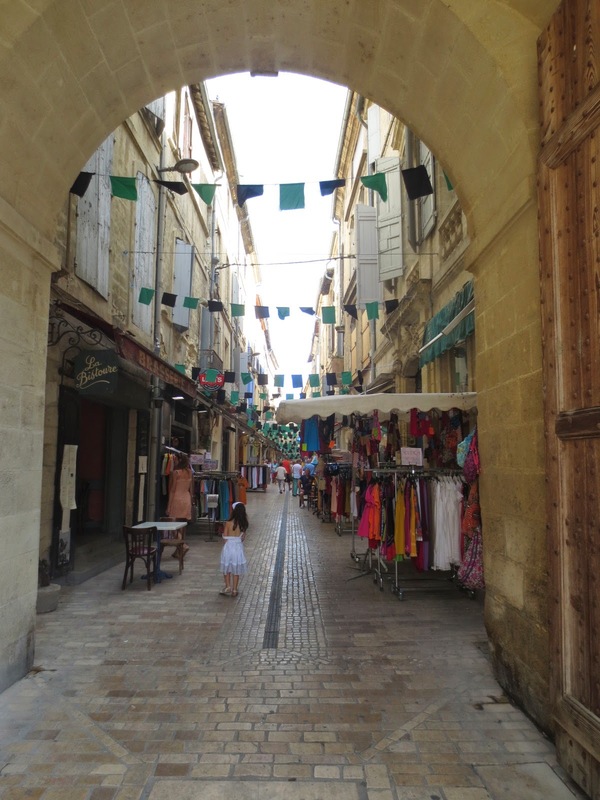 Uzès is very cute and tasteful town because it's duke's town. We had a very nice lunch at a restaurant and visited the Duché Palace. After Uzès, we drove to Sommières. It's even smaller than Uzès so there aren't much things to do normally but when we arrived there, the summer night market was started.. We bought sausages, olives, dices and Belgian beers! We bought the dice sets made out of bull's horn. He is a Madacascan artist. Recommended by our friend who lives in Junas, we went to this little restaurant near Sommières, La Table du Marché. It was a fantastic dinner! I highly recommend it! Foie Gras Crème Brûlée~ So very creative and delicious! Ok! Finally we are in Junas for the concert! And guess what!!!! As soon as she started to sing, just one word, the rain started and pouring down on us. The concert was cancelled at 11:10! (It was scheduled at 10:30pm but she came up to the stage after 11pm and the concert was cancelled at 11:10pm) How sad!! I really wanted to see and listen her live! Well! C'est la vie!!! Except, of course, the concert being cancelled, everything was great! 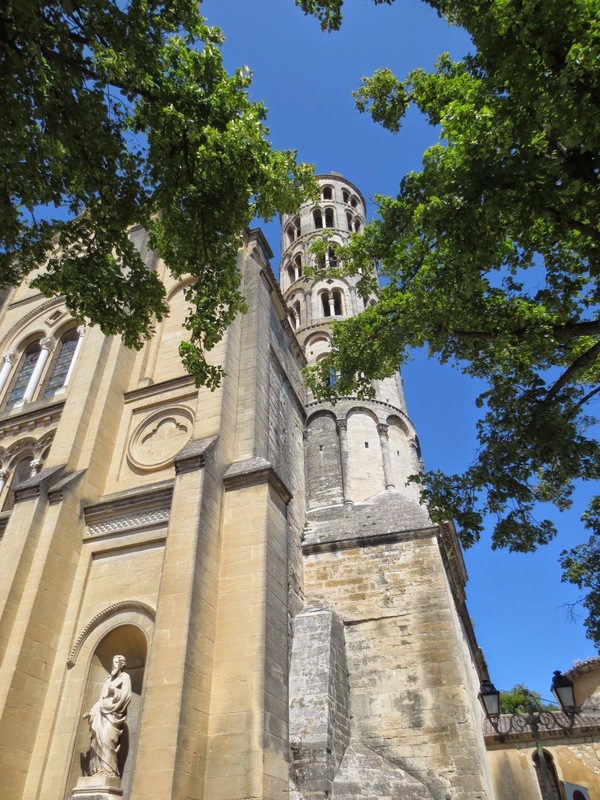 If you have a day for traveling around Montpellier and Nîmes but don't want to go to all extremely touristy place, visit this little two towns..